The Resolis parish registers contain the following entry. Risolis April 31st 1771 / I John Holm Taxman in Tobberchurn bequeath in favour of my youngest son John that stone which occupies the fifth place from the Church of Kirkmichel wester door which the foundation of said Church indicates, the stone next to that to my eldest son David, & the most remote from the first to my second son Thomas / in witness whereof behold my subscription / John Holm in Tobberchurn / & the other witnesses / A. Maclean Taxman in Brea / A. Hosack Weaver there / William Holm Weaver Newmiln / Done according to above date by / John Fraser Sess. Clk. 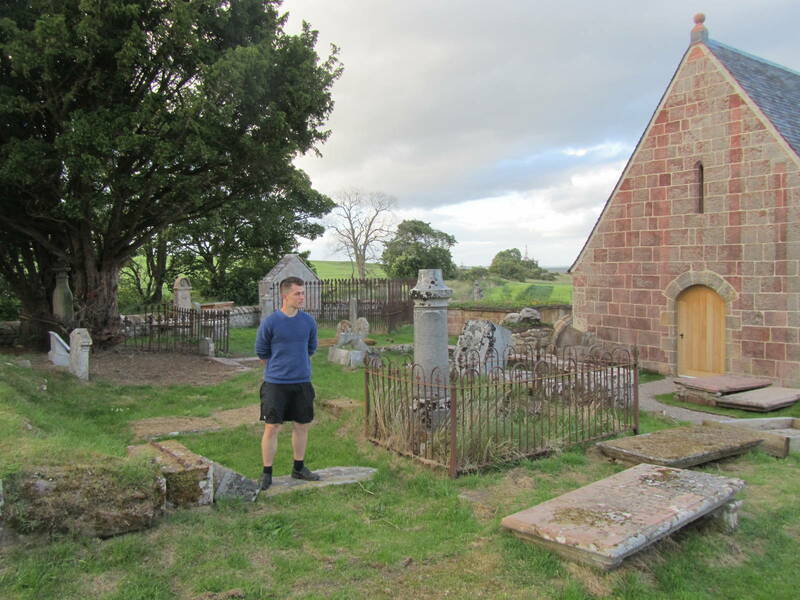 So here is grandson John now with four gravestones in his ownership. Grandson David was quite hard done by, with only two gravestones to his name! 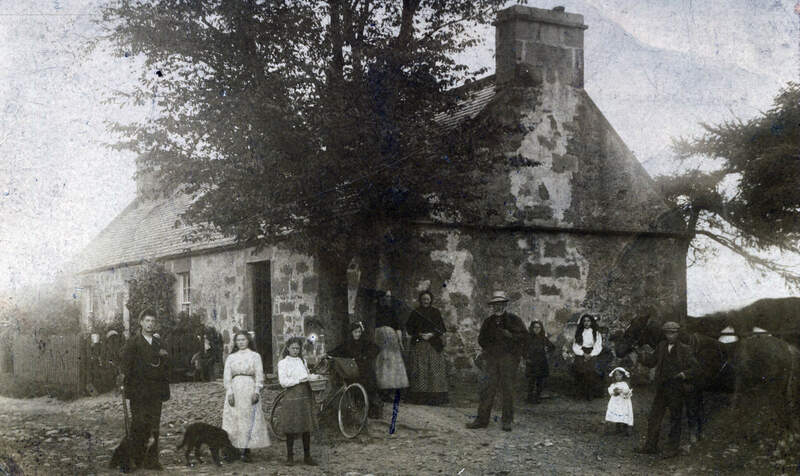 There were many Holm families in the 1700s and 1800s in the area, particularly in the united parishes of Kirkmichael and Cullicudden commonly called Resolis. The only representatives I am aware of now present are the descendants of the aforementioned David, of the two stones. He married Jean Murray roughly about 1795, and the pair became the great-great grandparents of good Friend of Kirkmichael James Holm, who farms at Easter Ferryton. His great-great grandfather was tenant at Ferryton back in the late 1700s! Other descendants live in the Black Isle and Easter Ross and further afield. Eldest brother John, of the four gravestones, married Isobel Barnet roughly about 1789, and some of their descendants (via John’s daughter Katharine Holm) have been in touch with me regarding their Resolis origins. And I am aware of great numbers of all the Holm families from this area now spread across New Zealand, Australia, U.S.A. and Canada. 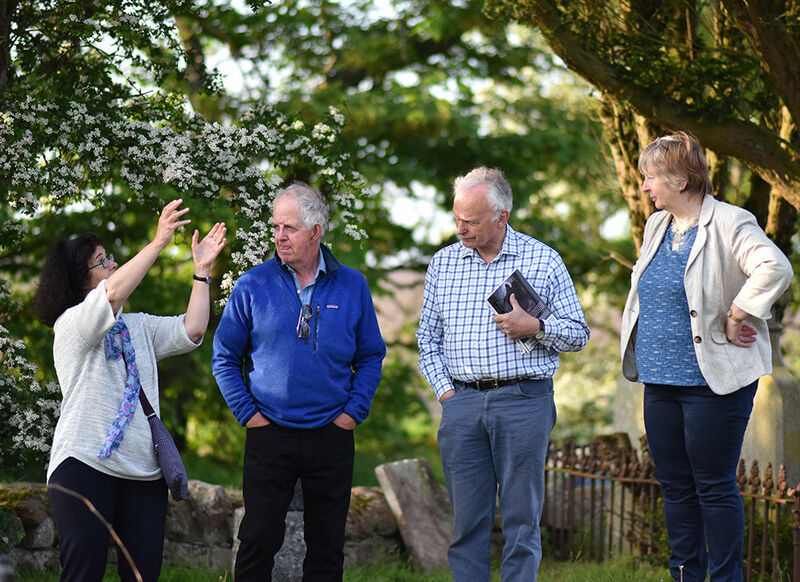 A scattering of Holms are mixed into the images of Kirkmichael activities below. Can we locate any of these slabs mentioned 250 years ago? Very few of them bear full names, only initials, and this can be challenging when so few Christian names are used. “IH” for “John Holm” is particularly popular! And into the bargain the use of many of these stones as memorials was already centuries old, with initials of previous owners carved onto them, or sometimes partly erased. Two at least are Claymore stones, dating to the early post-Reformation days, albeit the claymores are getting very faint now. 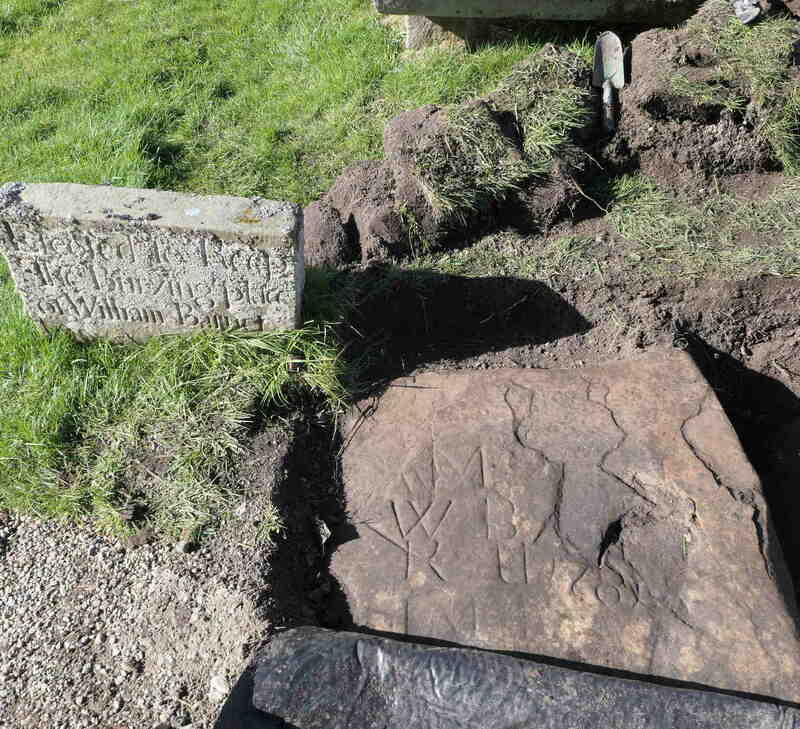 There are several dozen Holm stones in Kirkmichael, counting all the “H” stones in Holm family locations. However, John of the three stones back in 1771 mentions the stones counting from the doorway to the former nave so we have a definite location. Now, there is a long line of slabs, starting inside the former nave, and coming out through the former nave doorway right down to the modern path, practically all of which are either “H” or “Holm” stones. 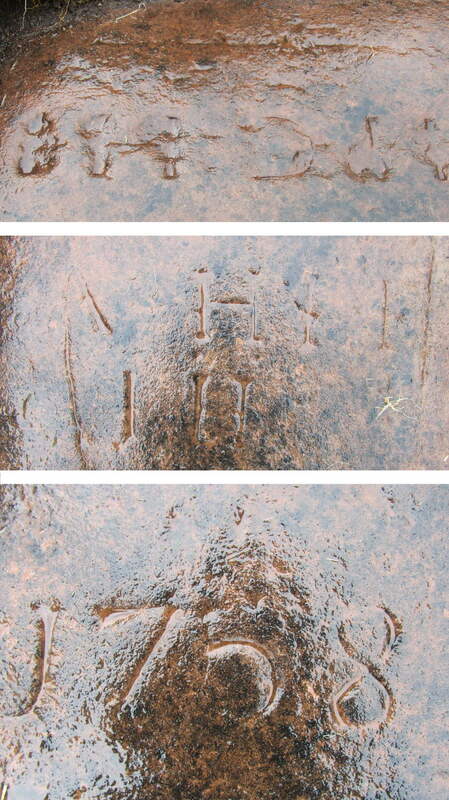 Some are so worn that we have had to use night-time raking light or photogrammetry to decipher the text. We have also had to cope with extreme mis-spelling including “HOLOM” and “TOLM”. Nevertheless, some of these stones must be the ones referred to by John Holm, tacksman of Toberchurn. I confess I am a bit confused by how John sets this out, and similarly by how his grandsons later testified as well, or if he meant north or south when he said “next”. 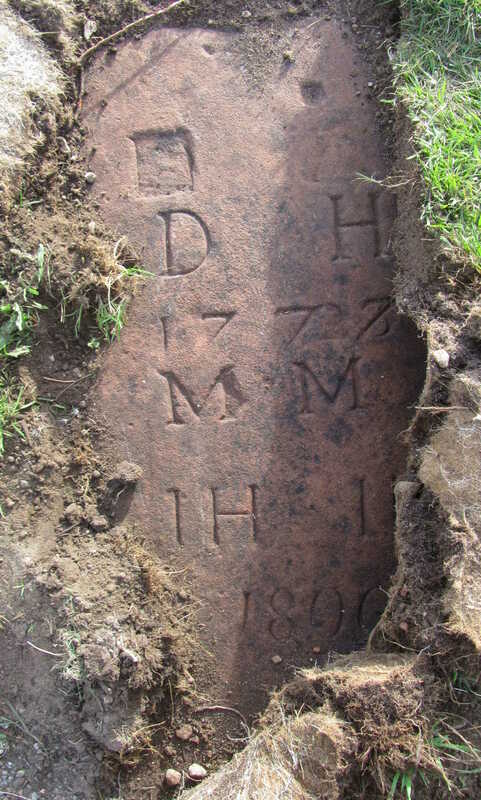 Nevertheless, I am sure the combination of initials “DH / 1777 / MM / IH IB / 1806” belongs to David Holm and Margaret Matheson and his son and daughter-in-law John Holm and Isabel Barnet. 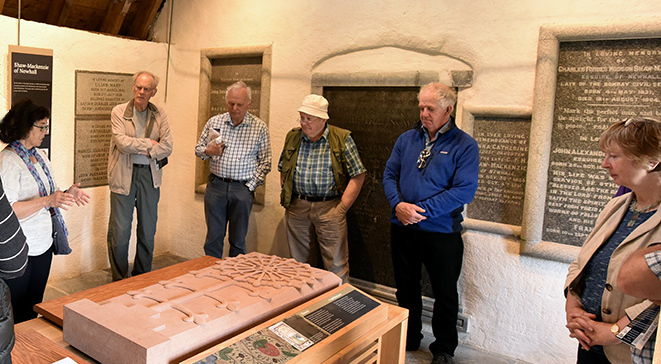 Extraordinarily then, despite the passage of 250 years, we have located the stone bequeathed to David Holm by his father John Holm, tacksman in Toberchurn. 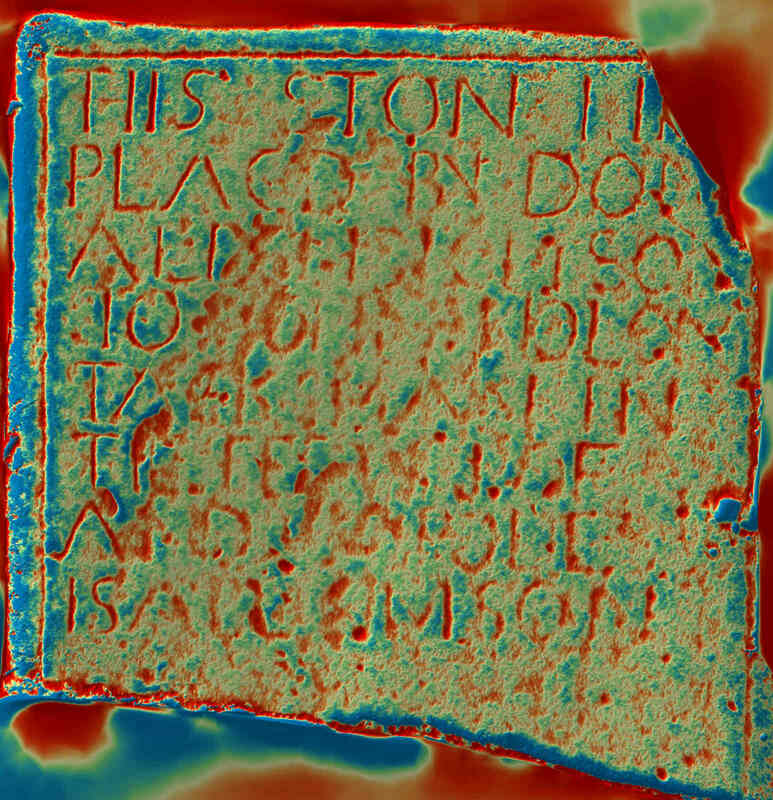 … but Andy Hickie’s photogrammetric image reveals so much more history on the stone. I think we can safely say David’s two stones have been located. But under which one were he and Margaret Matheson actually buried? We cannot say. 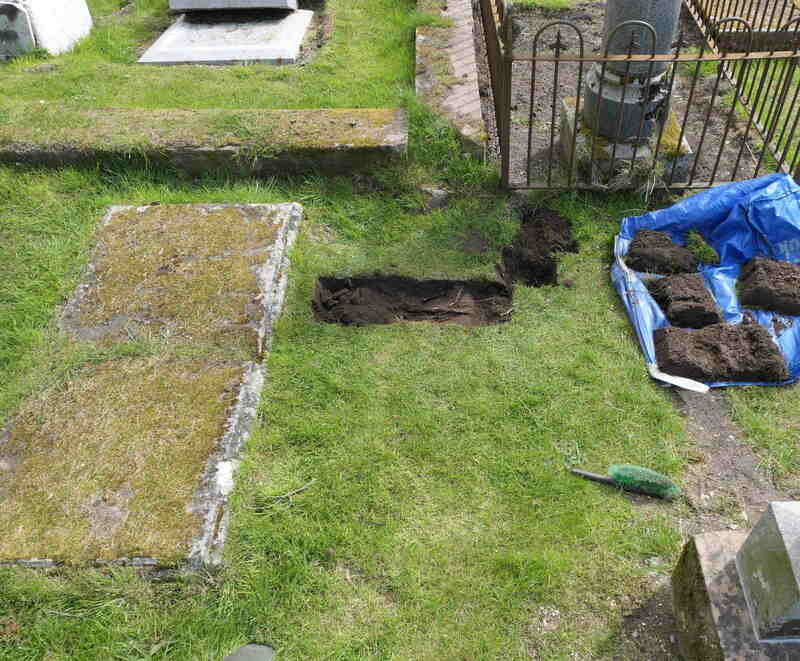 The problem is usually to find a gravestone at all, and finding two is a novel situation. 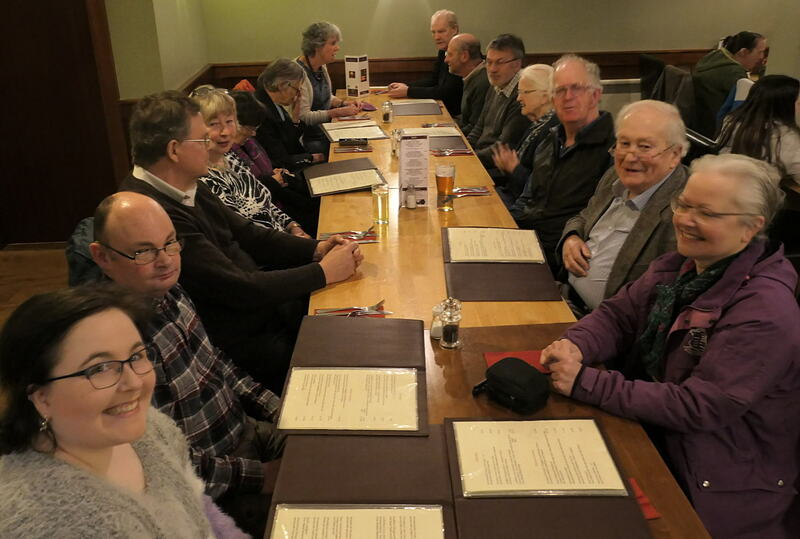 Whilst the stone to the north continued with the John Holm/Isobel Barnet branch of the family, the stone to the south continued with the David Holm/Jean Murray branch of the family. The more modern headstone beside the latter bears an inscription to the family of Thomas Holm, son of David Holm and Jean Murray. 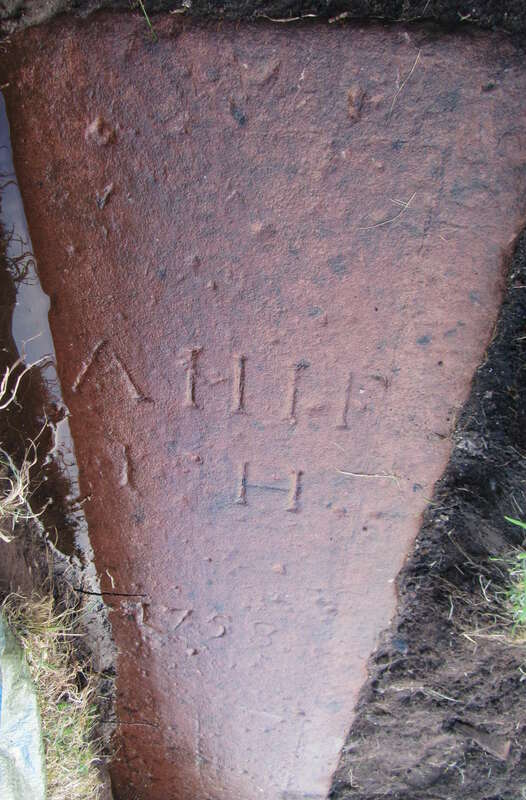 The modern headstone bearing details of the Holm family of Ferryton. The Holm family demonstrated a lamentable lack of originality in their Christian names! So that is the DH MM combination on the stone. Now, the son, John Holm, married Isabel Barnet, so there we have the second combination of initials – IH IB. We can tell that this Holm line was more prosperous than most others in the parish, as they held substantial (for the time) tenancies from the laird. John Holm was termed “taxman” i.e. tacksman, a superior tenant who held his land directly from the laird and had sub-tenants below him. He was tacksman in Toberchurn, to the west end of the united parish. His son David was tacksman in the Birks and at Ferryton, much further east, and David’s son John actually owned property. So don’t rely on a location as fixed point of reference in family history! 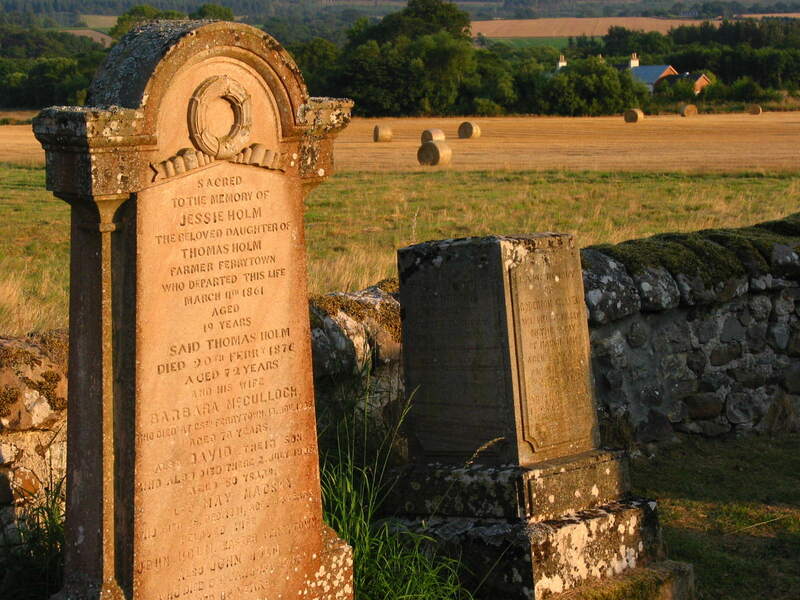 We don’t know when David passed away, but presumably it was not long before 1802, when his two sons, John and David, claimed their stones in Kirkmichael. His death was probably the trigger for them to sort out the complex ownership of stones – and there would be few families with so many stones to deal with! Let’s look at these two sons, as we know a lot more about their lives. Janet (6 Jul 1805) John Holm in Achmartin & Isobel Barnet. This is why, in 1802, when he was claiming ownership of multiple stones in Kirkmichael John described himself as “tenant Auchmartin”. 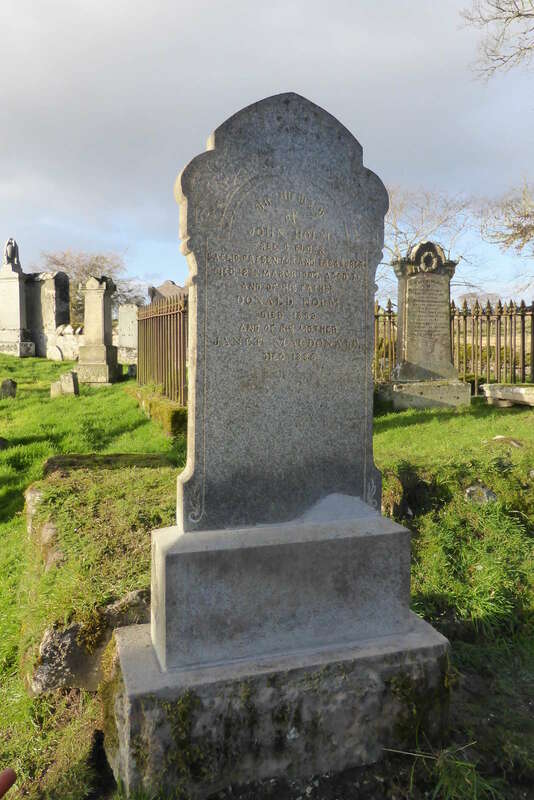 But when the family were summoned as witnesses in a murder trial in 1812 the summons was expressed as: “John Holm Feuar in Chapelton in the Parish of Risolis and County of Ross Isobel Barnet or Holm Spouse to the said John Holm and Mary Holm Daughter to the said John Holm”. And when he wrote his will in 1826, he described himself as John Holm Ferrytoun. Do not rely on location! John Holm was unusual in several ways. John Holm Feuar Residing at Chapeltown of Newhall as Proprietor of all and whole that piece of ground in the Village of Chapeltown of Newhall consisting of 60 yards in length and 30 yards in breadth with the dwelling house built thereon and Garden & Ground thereto belonging. And also all and whole that other piece of ground of equal length & breadth adjoining to & lying to the north of the land first above mentioned together with the dwelling home, Boil house, Barn, stable & Byre with the Gardens pertaining to the said subjects. That curiously-named “Boil house” comes up in his will. Secondly, he was very well organised. 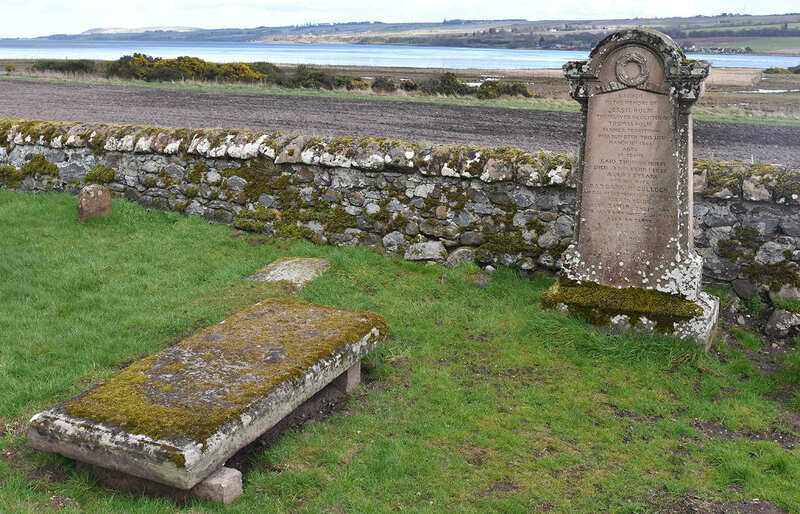 He made sure that his inheritance of four gravestones in Kirkmichael was recorded in the Church registers, in 1802. He had one of them inscribed with his initials and the initials of his wife, Isobel Barnet, in 1806, whilst still a young man. He wrote his will in 1826 at least 15 years before his demise. And finally, he does not appear to have been a very forgiving man. Expressly require that no part of my Subjects heritable or moveable Shall be given to my Son John Holm on acct of his disregard of my commands at his Marriage. Any Party dissatisfied with my Will & that shall attempt to Dispute it at Law, shall be Excluded from any Share Whatever of the Subjects Desponed. No record of his marriage to Isobel Barnet has survived, unfortunately a common occurrence in this time period when the Reverend Robert Arthur was in charge. Their first recorded child was baptised in 1790, so presumably they were married a year or two before this. Isobel Barnett was given as 80 in the 1841 census, when ages were meant to be rounded. However, they often didn’t in Resolis, and her husband John Holm was given as 83. If 80 was correct, then it is likely she was the daughter, baptised in 1762, of “William Barnat servt. Little Ardoch & Kathrine Urquhart”. That, however, is pure conjecture. But it is noteworthy that the stone bearing the initials of William Barnet and Katherine Urquhart and the stone bearing the initials of John Holm and Isobel Barnet lie with only one, deeply buried, stone between them. You may have picked up on a reference to murder there. 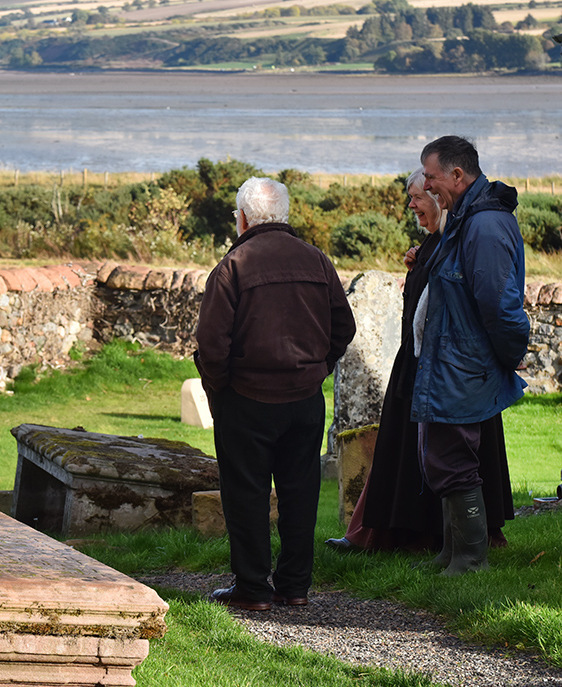 You can find the whole story in “Resolis Slope of Light Guide to a Black Isle Parish” – obtainable from our sales page on this website (all proceeds to maintain Kirkmichael!) 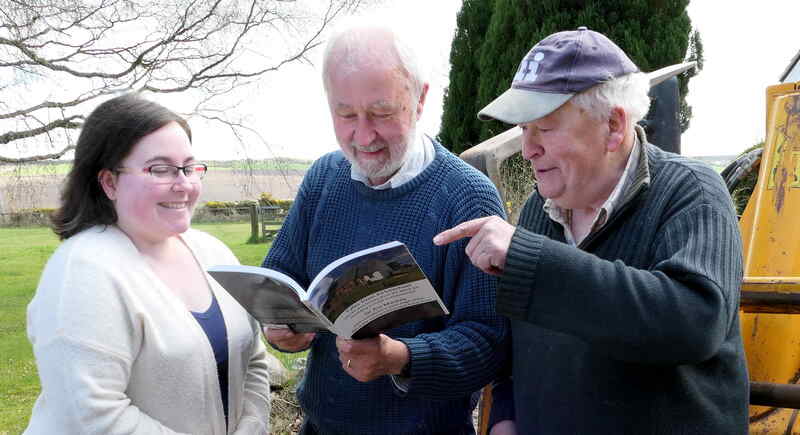 – but in a few words, in 1811, carpenter Robert Ferguson was on bad terms with his volatile neighbour in Chapelton, Captain Charles Munro, over Robert’s cow grazing in the good Captain’s garden. When the Captain came into the smiddy adjacent to Kirkmichael (nails keep turning up when the field where it stood is ploughed) he found Robert there, shouted at him and pushed him down. Robert, who had earlier in the day had been drinking whisky and beer, some with farmer and drinking companion John Holm, got up with his knife and stabbed the Captain, who cried out “The Scoundrell has wounded me and brought out my Guts”. The surgeon was called from Cromarty, but the Captain expired, exclaiming that he wished he had died on the field of battle. Meanwhile, Robert had hastily crossed the Firth and was making his way down Easter Ross when he foolishly went in to have a beer at Saltburn, where a posse organised by the laird of Newhall caught up with him. In 1812, Robert was hung at the Longman, but in the meantime had found God and blamed intemperance for his actions. That previous to the Declarant’s Interview with Captain Munro as above Declared he was in the Publick house of Balblair in Company with John Holm Farmer, and John Simpson Carpenter, both residing at Balblair, where they drank three half Mutchkins of Whisky, and the Declarant in the course of the day had drunk besides Several Glasses of Whisky with some Ale. That the Declarant and the said Captain Munro’s houses are within Sixty yards of each other, and for the last Eighteen Months the Declarant and Captain Munro were on bad terms with each other. Only John testified, and he simply corroborated the fiery nature of Captain Munro (he deponed that Capt. Munro “was a warm-hearted man, although rather rash when any thing vexed him.”) This did not save Robert Ferguson, but must have taken some courage given the sympathy for the victim (about whose demise a ballad was composed (“Young Munro, Charlie agam, / Young Munro, s’ tu mo ghaol.”) Perhaps John Holm’s sympathy for Robert Ferguson contributed to his seeking to evict the Captain’s spouse from his property the following year. Will of John Holm March 1826 / Will of John Holm Ferrytoun – Whole Subjects to be Liferented by his present wife Isobel Barnet – and at her Death – the House called the Boil House to belong to my two unmarried Daughters Mary & Helen while they remain so, or to the one remg unmarried – Also at her Death the whole Subjects with the Above Exception to be Divided equally among the whole of my married Daughters in equal shares, except that my Son in Law Wm Hogg shall have equal to 2 Shares – I Expressly require that no part of my Subjects heritable or moveable Shall be given to my Son John Holm on acct of his disregard of my commands at his Marriage [illegible word] – and should my oldest son David be in life, on return to this Country that he shall have & Enjoy the full half of the Heritable Subjects the Other Half to be Divided as above stated among my other Living Daughters at the time of my wife’s Death. / Any Party dissatisfied with my Will & that shall attempt to Dispute it at Law, shall be Excluded from any Share Whatever of the Subjects Desponed. Will of John Holm 1826 / In addition to my former Will I Give to my Eldest Daughter the half of my Large press contg the Drawers – the other half to Alex Fraser Husband of my Daughter Katharine – Wm Hogg to get the large armchair and a Square Table; our Common Table, with a Chair and Box bed to be given to my D Helen the Round Table – a Looking Glass & Cupboard with a Chair & Stool to belong to my wife and at her Death to belong to my Daughter Mary – My Son John to have no part or portion of my Effects Except 20/- to be given him after my Death – The Whole Bed Cloaths to belong to my Daughters Mary & Helen after my wife’s Death. In fact, John Holm lived on long after his will, and both he and his wife were still alive at the time of the 1841 Census. The young Frasers present in the household were grandchildren, the children of Alexander Fraser (who had died young) and Katherine Holm, to whom we shall return. David Holm and spouse Jean Murray, as great grandparents of my cousins, the Holm family of Easter Ferryton, are of particular interest to me. You will have gathered that this Holm line were not poor sub-tenants or mailers, but were substantial tenants within the parish and therefore, you would think, would be relatively easy to track. Typically of the Reverend Robert Arthur period, no record of the marriage of David Holm and Jean Murray has survived, but I would expect given that David was born in 1776 and his first child was born in 1798 that they married around 1797. Apart from one period at St Martins, it appears that David was a tenant at Ferryton for a long time. It was as “tenant Ferrytown” that David described himself when claiming his stones in Kirkmichael in 1802. We don’t know when David or Jean died. I did think initially that David at least died quite young as he appears on the 1814 militia roll but not on the 1820 militia roll. David junior appears on that roll, and several more sons appear on later rolls as they came of age, but not David senior. But then I recalled that the militia roll in this period included males only between the ages of 17 and 45, and in 1820 David senior, who had been born in 1776 would have been at the upper limit for inclusion. 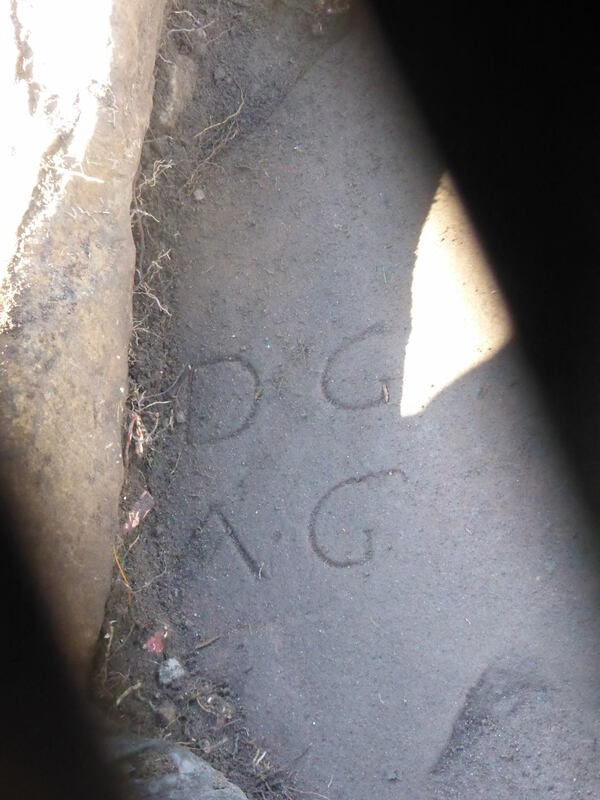 I therefore do not know if it was David senior or junior who was the subject of a most entertaining report by stonemason, geologist and writer, Hugh Miller, indicating the dangers of basing too much on initials! This story can be found within the Inverness Courier of 11th August, 1830. SUPERSTITION.– On Monday last, a case illustrative in some measure of those superstitions which still linger in remote districts of the north of Scotland, was tried in the Justice of Peace Court at Cromarty. Some time since, a small anchor was stolen from the defendant in the case, John Fraser, who is a parish of Resolis boatman, and as neither natural sagacity nor assiduous enquiry furnished any clue to a discovery, he determined on having recourse to supernatural means for the recovery of his property; and so when on a voyage to Inverness, he applied to the redoubted Miss Hay, the Spaewife. After he had stated the case and made her a small present, she scrawled with a piece of chalk on a board the letter D, and told him that the first person he would meet with after landing at Resolis, whose name began with that letter, was the person who had stolen the anchor. The poor boatman was quite delighted with the prospect of discovering a thief, and recovering his anchor in a manner so ingenious; and he set himself on his way homewards to sum up all his scholarship, that he might not lose the benefit of Miss Hay’s advice through false spelling. The boat arrived at her port, the boatman leaped ashore, his head full of letters and syllables, and wonderful to relate, the first person he encountered was (the pursuer in this case) David Holm, a farmer at Ferry-town. There was no possibility of mistake. David most certainly began with a D, and it was an incontrovertible inference in the boatman’s logic that David had stolen the anchor. He accordingly charged him with the theft, and in return was prosecuted with defamation. The Justices having found that the pursuer, a man of good character, had, in consequence of the charge, suffered in the opinion of some of his more credulous neighbours, and that this charge the defendant could only support on the authority of the Spaewife, discerned that the latter (Fraser) should be fined the sum of £2, and gave orders that a copy of this sentence should be affixed to the door of the church of Resolis, that it might be known in the parish that Miss Hay’s predictions are not held good in law, and that it is quite possible that the name of a person who had never stolen an anchor, may begin with the letter D.
Whilst this story is entitled “H is for Holm”, in this case John Fraser was acting on the principle that “D is for David”! I note from the militia records that David Holm junior was a Constable so that he would have had good reason to seek to prove his good character. One of the other sons of David Holm and Jean Murray was Thomas (1803–1876), who married Barbara McCulloch (1816–1889), the daughter of a neighbouring farmer. It is this line through which the modern Holm family of Ferryton descended. And now the fly in the ointment. You will note that John Holm (Isobel Barnet’s spouse) and David Holm (Jean Murray’s spouse) refer in 1802 to their “Grandfather Wm. McAllan Brealangwell” bequeathing them stones. William McAllan does not feature in any baptism or marriage record in Resolis but there is a passing reference to a man of that name, appearing on a sasine (RS38/10 folio 115 verso to folio 116 verso), registered in 1751. It commences “comparuit Gulielmus McAllan discretus vir feber ferrarius in Brealangwell tanquam actornatus et procurator pro et in nomine Caroli Urquhart de Brealangwell” – in other words, William McAllan, blacksmith in Braelangwell, appeared, acting for and on behalf of Charles Urquhart of Braelangwell. Clearly there could not be two separate marriages, both involving David Holm, son to John Holm tenant in Toberchurn, and Margaret, the daughter of a William, blacksmith in Braelangwell. How to reconcile this? Was McAllan a local patronymic for Matheson? Did the writer of the entries in lair transfer records, the Church Officer John Holm, simply write down the wrong surname? There were no witnesses and the two claimants did not sign the document so a mistake by John would have passed unmissed. The family trees are a perfect fit so that they simply have to be the same, there can be no doubt about it, but we have this odd reference in the lair records to a grandfather’s surname which is not correct! The children recorded in the baptism register were Mary (1790), Cathrine (1791), David (1794), Isobel (1796), Nelly (Helen) (1798), John (1801), William (1803) and Janet (1805). I have been unable to track the sons with any certainty, but most of the daughters were relatively easy to pinpoint. Sisters Mary (1790–1867) and Helen (1798–1870) never married. They lived in house with their parents at Chapelton, and can be found in the Valuation Rolls of 1855 and 1865 as owners of their property. They can be seen residing there in 1841, 1851 and 1861. On their deaths, they were recorded as “feuars” underlining the significance of their owning their own property. Katharine is of particular interest as she and several of her family returned to Resolis upon the death of her husband. 1823 … Alexander Fraser lawful son to William Fraser in the Parish of Calder & Katharine Holm daughter to John Holm at Balblair in this Parish were contracted on the 11th July & married in due time. The medical office certifies that this applicant is subject to … affliction of the lungs of long standing & at this time of life probably incurable. 3. David – married and a labourer in Croy. 4. Alexander – Gone to Australia 8 years ago. 5. Isobella – unmarried & an outdoor worker. The descendants of Alexander Fraser and Katharine Holm include my correspondents Rod and Steve Fraser of Australia, who are descended from ”Alexander – Gone to Australia 8 years ago”. Margaret lived with her parents, and then with her brother Thomas, in the family home at Ferryton. She never married. Census returns tell us that sadly she was deaf and dumb from birth. She died a pauper, her death being registered by her niece, May Holm. Isabella similarly lived with her parents, and then with her brother Thomas, in the family home at Ferryton, also dying a pauper, her death being registered by her nephew, Thomas Holm. In the militia records, the brothers were farming together at Ferryton. Thus we find in 1823, David, Thomas and Hugh all together, and all aged under 30, with David being a Constable and thus exempt from service. By 1826, Hugh has vanished from the scene, but they are now farming with their brother William, who is also exempt on account of his deafness. Thomas achieved some notoriety as one of the rioters indicted to stand trial before the High Court of Justiciary in Edinburgh, following the 1843 Disruption riots in Resolis. 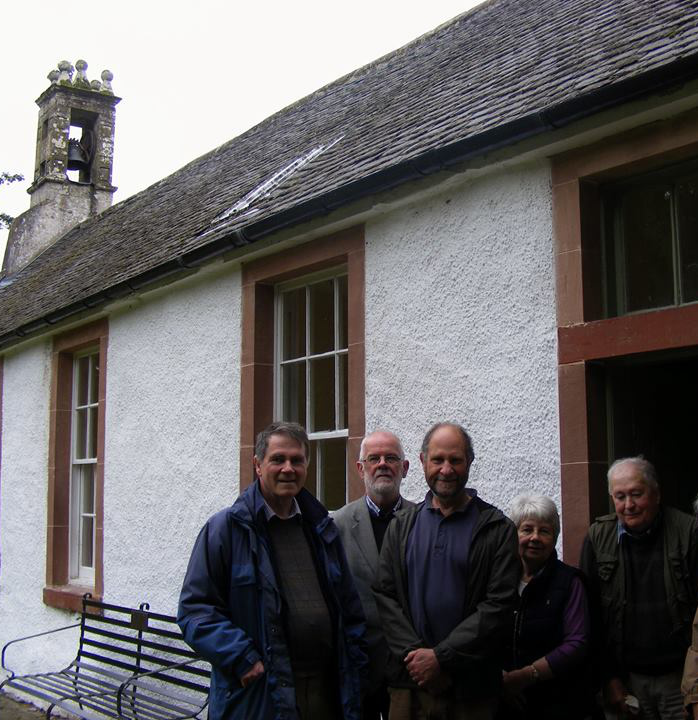 The congregation in Resolis, as in many other parishes around Scotland, left the established church to form the new Free Church, where the lairds did not control who became the minister. The congregations forcibly resisted the subsequent investiture of ministers in the established church, in the case of Resolis by means of several hundred parishioners throwing stones and threatening the gentry and presbytery trying to break through to the church. Compeared Thomas Holm Farmer at Ferrytown in the Parish of Resolis and County of Cromarty who being judicially examined and interrogated, Declares that he remembers the day on which the Reverend John Mackenzie was to be Settled as Minister of the said Parish. That about two Oclock in the afternoon the Declarant went to the Church which is about a quarter of a mile distant from Ferrytown and found a good many people assembled there. That there were some strangers among the Crowd and the Declarant saw stones flying about. That the Declarant did not throw any stones; and he had no stick and he was not present at the beginning or the end of the proceedings altho his name happened to be taken up. That the Declarant heard shots fired but he was at some distance and he did not see who fired them. Declares that the Declarant did not take any part in assaulting or forcing away from the ground any of the strangers who came to the Church of Resolis on the day above referred to. That the Declarant kept out of the way of the Officers of the law for some time after the above occurrence and was not apprehended until Saturday last. All which he Declares to be truth and Declares he cannot write. In the event, though indicted to appear at the trial on 10 January 1844 in Edinburgh, Thomas Holm does not feature in the trial proceedings themselves, so the case against him must have been dropped. There is a note written on his statement saying “Not called”. 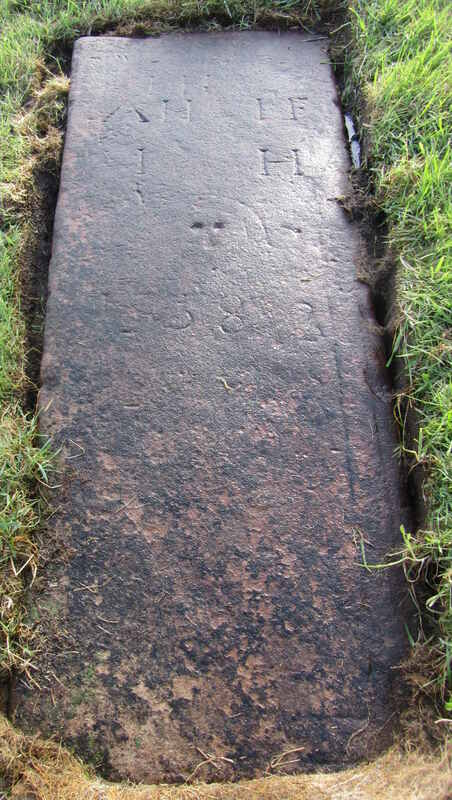 The tablestone in the south side of the kirkyard, with, behind, the headstone to Thomas Holm and Barbara McCulloch of Ferryton and children. These two stones span four generations of the Holm family of Ferryton. Sacred / to the memory of / JESSIE HOLM / the beloved daughter of / THOMAS HOLM / farmer Ferrytown / who departed this life / March 11th 1861 / aged / 19 years / Said THOMAS HOLM / died 20th Febry 1876 / aged 72 years / and his wife / BARBARA McCULLOCH, / who died at Estr Ferrytown 13.Nov.1889 / aged 79 years. / Also DAVID, their son / who also died there 2.July.1905 / aged 60 years. / Also MAY MACKAY, / who died 29.Dec.1931, aged 64 years / beloved wife of / JOHN HOLM, Easter Ferrytown. / Also JOHN HOLM / who died 6th January 1940 / aged 88 years. 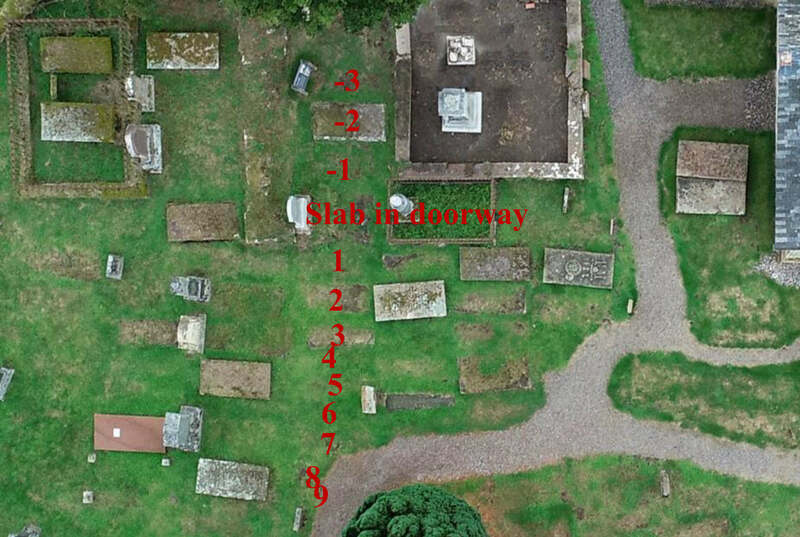 From north to south, these are the stones running from inside the former nave at Kirkmichael, out through the doorway, down to the yew trees in the centre of the kirkyard. 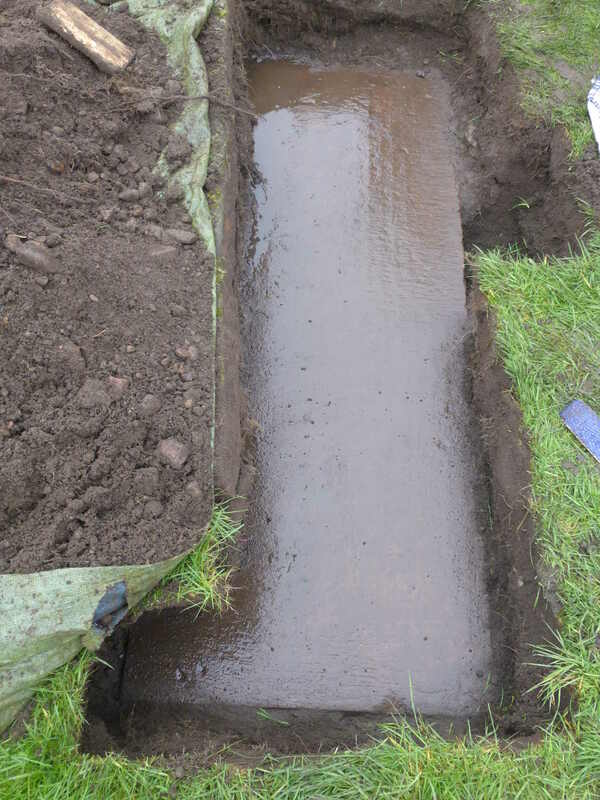 Most of them are buried under turf, several to considerable depth (the top of the deepest being 330 mm underground). Few of them bear inscriptions, carrying instead a few initials and dates, never a date of death – more likely the date of purchase of, or claim on, a lair. Most of them were re-used stones, some of them from the period just after the Reformation when the only symbol which was not anathema was the claymore. The line of stones investigated in this Story, of which only the bottom two (8 and 9) definitely are not associated with the Holm family. 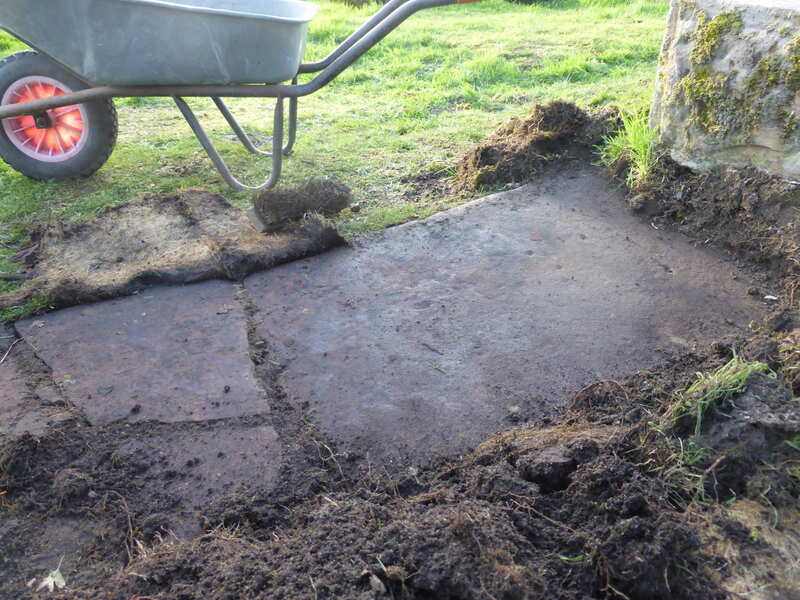 Third slab inside the former nave being exposed; it has no inscription distinguishable. Second and first slabs inside the former nave. The second is on the left, broken but mostly readable. 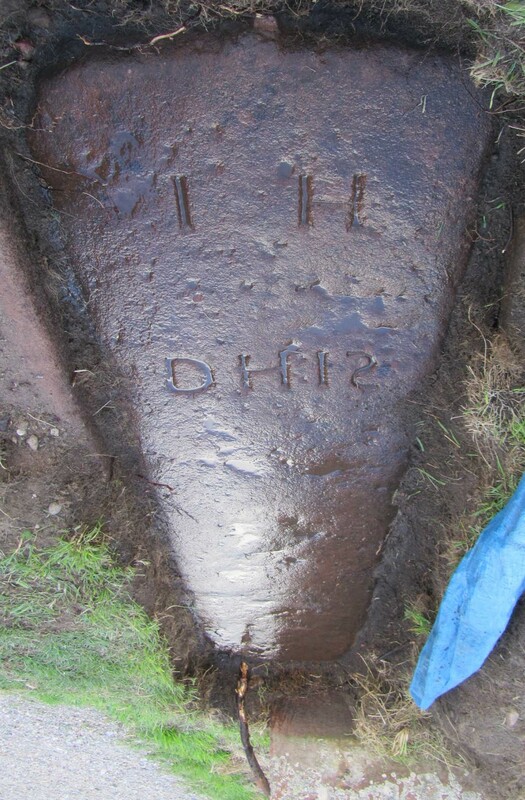 The third is being excavated – it is very worn. The tarpaulin sits on the former doorway. First slab inside nave under extreme raking light. First slab inside nave using Andy Hickie’s photogrammetry. Gavin stands atop the fallen headstone which formerly filled the former doorway to the nave. 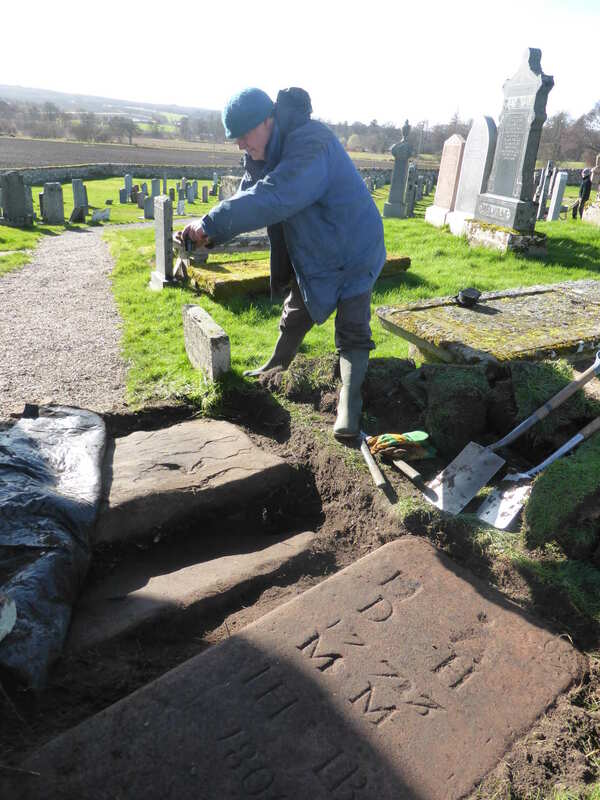 The headstone repaired and re-erected for the Trust by Hood’s of Dingwall. No inscription distinguishable on the slab which occupies the space of the former doorway to the nave. First stone south. A faint claymore can be seen (the terminals at the end of the handle and quillons are most obvious) on the first stone south from the doorway. Second stone south. The three separated sets of symbols; the top set were probably deliberately obscured when the stone changed hands. 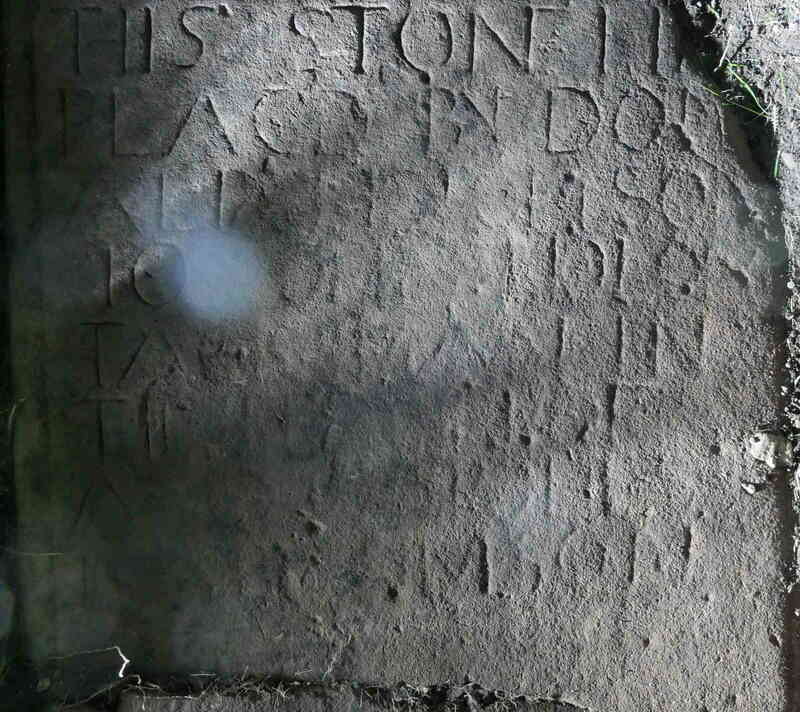 Third stone south, bearing the typical be-wigged skull and crossbones of a grave slab of the 1700s. 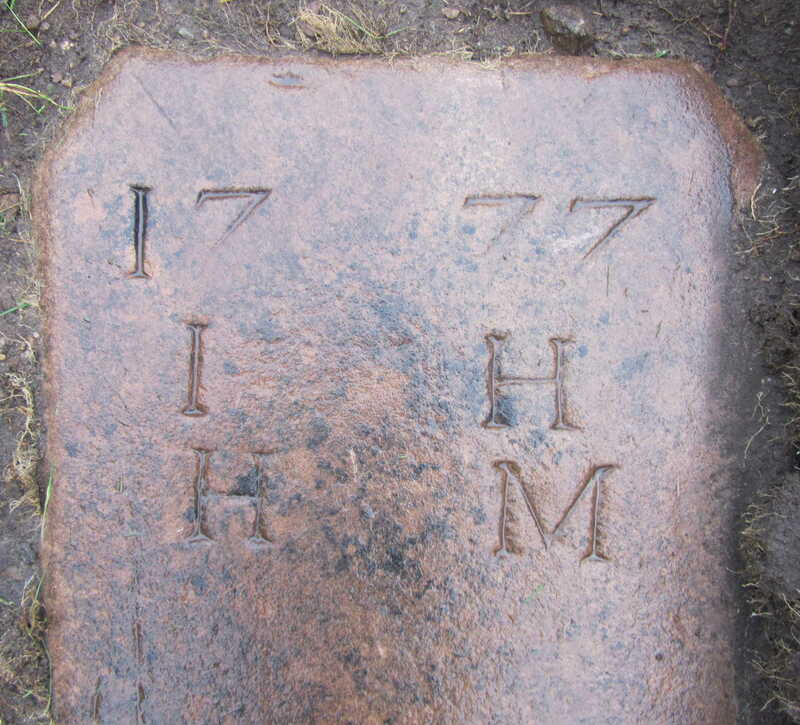 These three stones carry the same inscription and date, so another group owned by one man, in 1758. The fourth, deeply buried stone; it is not worn – it simply never bore an inscription. The fifth stone south from doorway of former nave. You can just pick out perimeter lines from a previous use of the slab before it was taken over by the Holm family. The sixth stone south from doorway of former nave, and clearly a very old stone indeed, re-used in the 1700s. From right, seventh, eighth and ninth stones south from doorway of former nave, the final two now partly under the path. 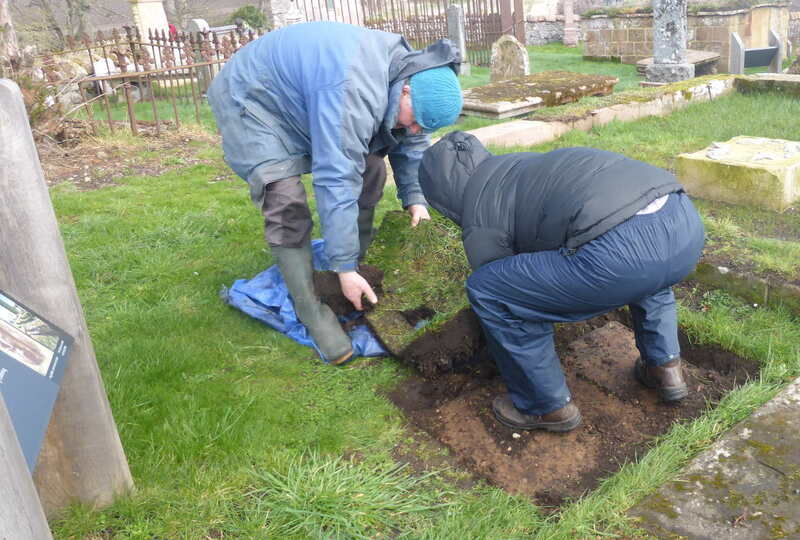 The deeply buried eighth stone south; we have not identified which family owned this stone. The ninth slab south from the doorway of the former nave, a Barnet stone, with a more recent Barnet marker stone adjacent.